It's time once again to introduce you to the lovely folks behind the colorful sidebar ads. As it happens this month, all make things from paper, but some offer other surprises as well. Navanka Creations is owned by two sisters who share a passion for making pretty and useful items. 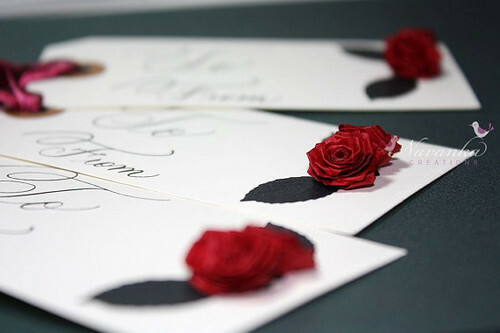 These folded rose tags, for example, are perfectly quilled and would dress up a present in a special way. 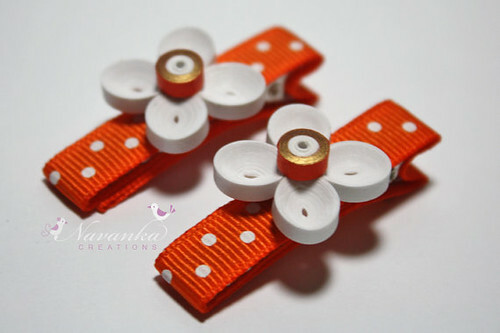 Their alligator hair clips are so cute for little girls! Available in lots of bright colors, each has a different quilled decoration. Coasters, wall art, cards, and money holders are also available. You'll find Amrita and Nimisha at their shop and on Facebook. They blog at Navanka Creations and are offering a 10% discount to All Things Paper readers until June 15th. Enter code ALLTHINGSPAPER at checkout to receive the discount. You might remember Maria Noble from St Jude's Creations via her recent giveaway of a crepe paper flower arrangement. 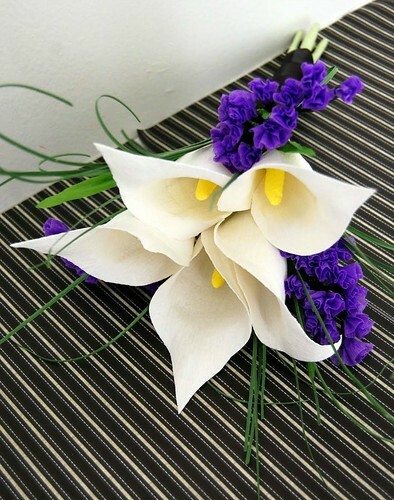 She is able to beautifully recreate any flower you can think of. 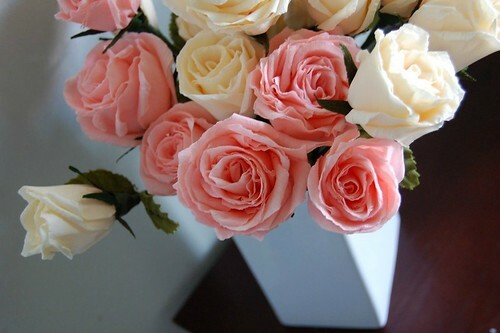 These roses look real! First anniversary gifts (the tradition is paper) are a specialty, and she creates bridal bouquets, boutonierres, and table centerpieces. Contact Maria via her Etsy shop with your custom requests. She also blogs. 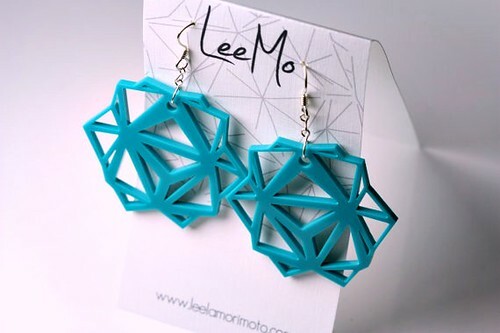 Leela Morimoto of Etsy shop LeeMo makes intricate origami earrings that are as stylish as they are eye-catching. You might recall a feature about her earrings here. Leela kindly sent me a pair after that post as a thank you, so I can tell you firsthand just how perfect and pretty they are, not to mention they arrived beautifully packaged. 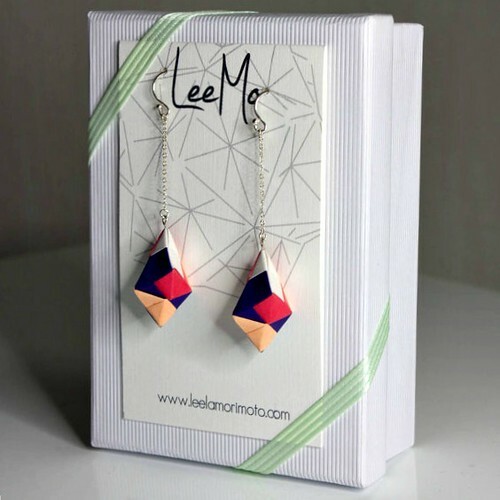 Not only does Leela make origami earrings... her lasercut type is made from your choice of sturdy, yet lightweight acrylic or bamboo. Leela recently moved back to the U.S. from Japan and is working hard to grow LeeMo Designs. She is on Facebook. 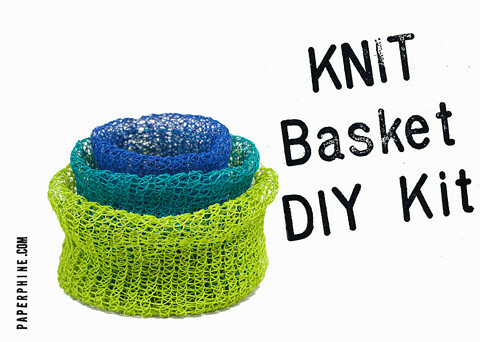 Last month Linda Thalmann of PaperPhine introduced us to her fab paper twine bracelet kit and now she has released a knitted basket kit. They look so easy to make (no knitting skill required!) and would help to organize your desk in a fun and colorful way. Along with a wide variety of paper yarn weights and colors, PaperPhine is also where you'll find wooden bobbins to use simply for display or as storage for lace and twines. Linda sourced these examples from an old New England mill. 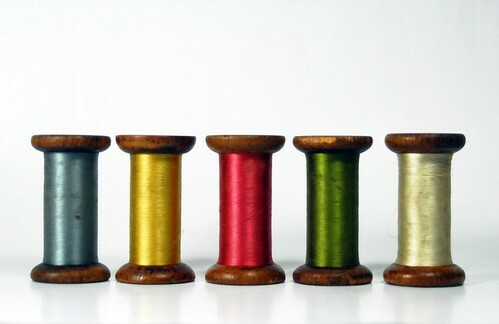 They will arrive still wrapped with the silk thread made there. Visit PaperPhine, Linda's blog, and her Kollabora page where she has been posting all sorts of great projects that can be made with paper twine. Melissa Kojima of Artist in LA LA Land loves paper play and her shop is a testament to that. 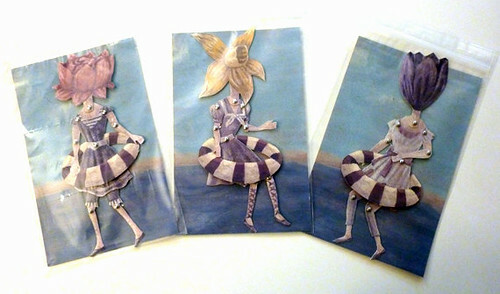 You'll find paper mache toys, jewelry, and articulated paper puppets that she designs and paints. These quirky flower head ladies can be yours in a flash... just print out the PDF, cut out the pieces, assemble, and send as a greeting card or keep them at your desk for idle moments. Let's end on a high via this performer doing acrobatics atop a circus elephant. 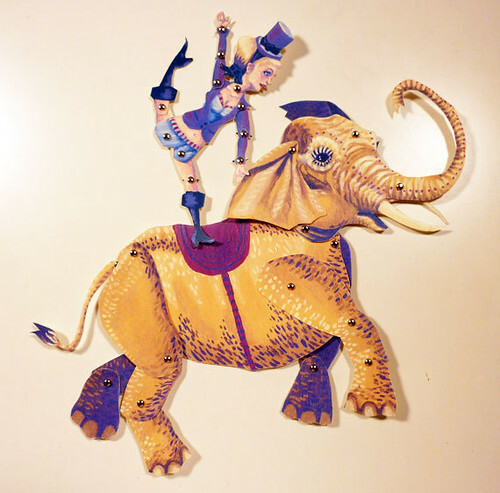 Melissa shares her love of vintage circus art by offering a variety of performers and animal puppets. Visit the Artist in LA LA Land Etsy shop. Beautiful!!! Love all the shops. Beautiful work by each and every artist!